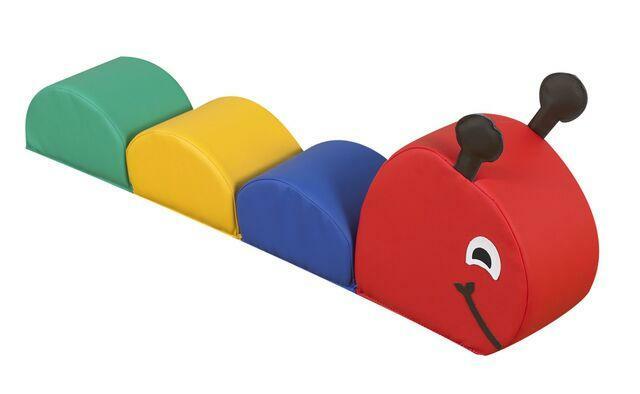 Crawl away on our bright and soft Crawly Caterpillar! Fun to explore and bounce from color to color while improving their balance and coordination. Caterpillar is covered in a soft, environmentally friendly easy to wipe clean polyurethane with soft foam filling. Each bump measures 6" high and the head measures 11" high. Each antenna contains a different sensory element, a squeaker and rattle. THIS ITEM WILL DROP SHIP FROM THE MANUFACTURER AND TAKE ABOUT 10-14 DAYS FOR DELIVERY. Dimensions: 41" x 6.5" x 15"